What a difference a year makes. Rising like a phoenix from the ashes of last year, we expect the exploration industry of 2010 to strive for ever increasing efficiencies to cope with the still volatile market conditions. A number of key technology areas merit attention for their potential contribution to improved efficiency of acquisition and enhancements to the quality of acquired geophysical datasets. Firstly, new streamer technologies have already demonstrated their capabilities and will continue to do so. Dual sensor streamer technology pioneered by PGS with GeoStreamer provides an elegant solution to the limitations imposed by the free-surface ghost effect. In this effect, energy reflected back with reverse polarity from the sea surface results in attenuation in the frequency spectrum which is dependent on the streamer depth. Shallow towed conventional streamers favour higher frequencies at the expense of low, whereas deep tows favour lower frequencies while notching at frequencies within the seismic bandwidth. However, collocating particle velocity sensors with the conventional pressure sensors in dual sensor streamers allows the two signals to be combined during processing and as there is no polarity reversal from the sea surface reflection for the velocity measurement, this combination cancels out the ghost reflection signal and removes the notches in the frequency spectrum. The benefits are substantial including improved signal to noise content across all frequencies resulting in improved imaging and resolution, and better inversion stability. Furthermore, the new streamers can be towed at greater depth reducing surface induced noise and extending the operational window in marginal weather conditions. The other proven approach to tackling the receiver ghost problem is over/under acquisition. 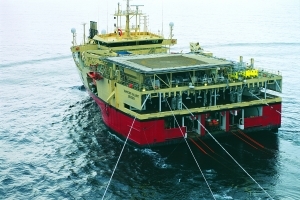 In this technique conventional streamers (pressure sensors only) are towed at depth in vertically aligned pairs. A new variation on this technique has recently been proposed by WesternGeco whereby the upper spread would be towed at shallow depth eg 6 to 8m to enhance the mid to high frequencies, with a reduced 'sparse' deployment of streamers at depth to enhance lower frequencies only. Again this has the desired effect of improved signal to noise at both the high and low ends of the spectrum, and as the deeper tow streamers are only required for low frequencies these data can be sampled more sparsely hence the need for fewer deep streamers and resultant improvement in acquisition efficiency. Likewise, research is ongoing into multi-level source arrays with the aim of attenuating the source ghost and there are some encouraging developments in this area. A second major field of interest at the moment is the area of simultaneous source marine acquisition. This is a well established practice in land seismic acquisition where vibration sweeps can be encoded but it has not been commercially employed for impulsive marine sources where an interfering source has traditionally been considered as noise to be removed from the data. The relationship between shot spacing, record length and vessel speed exerts a major constraint on survey design and acquisition efficiency. Pioneering research by a number of investigators including Craig Beasley at WesternGeco has demonstrated that significant improvements in data quality are achievable by firing simultaneous sources. Data processing techniques such as DMO and PSDM provide a geometry-related filtering mechanism to enable the data from interfering sources to be separately identified. This has the potential to deliver significant cost savings particularly on Wide Azimuth Towed Streamer (WATS) surveys where multiple vessels are deployed. The potential benefits are significant and include improvements in fold coverage (of particular importance in illuminating deep sub-salt plays), reduced shot spacing and faster acquisition. The increased speed of acquisition can have other benefits beyond just reducing the cost of survey vessel utilisation for example for undershoots around platforms better streamer control is possible at faster speeds and there are also HSE benefits from acquiring the data more quickly in congested areas. Furthermore, for VSP surveys faster acquisition could have significant benefits in reducing rig down-time. Simultaneous source technology is expected to be the focus of a major ongoing research effort in the coming years. Finally, the field of Controlled Source Electromagnetic CSEM surveying is an established tool for geologists and geophysicists to assist in the prioritisation of prospective plays in terms of likelihood of hydrocarbon presence. One of the drawbacks of EM prospecting is the significant additional cost and time overhead of current EM survey methods relative to that of seismic acquisition. This is primarily due to the deployment and retrieval time for the seabed receivers. However, PGS have been working on the development of a towed EM streamer solution which has the potential to drastically reduce the acquisition time for EM data. After encouraging field trials PGS have recently initiated a Joint Industry Project (JIP) to further develop this technology. A commercial solution still appears to be some way off with some significant technical hurdles to surmount but the potential benefits remain a powerful incentive to find a workable solution. This year the marine seismic market is showing steady growth despite continued volatility in oil prices. The offshore exploration industry will continue its ceaseless development of new technologies to deliver ever greater efficiencies in acquisition and improvements in the quality of the data collected. New seismic source and streamer technologies and methodologies will contribute towards resolving the source and receiver ghost effect in seismic data. Towed EM streamer development will hopefully progress to the point where a viable commercial solution comes to market. And finally, simultaneous source technology offers the prospect of delivering substantial benefits initially in the field of large scale Wide Azimuth surveys, but potentially across a range of different survey methods. The future looks very promising indeed.